Nurses can play an important role by identifying and reporting early signs of periodontal disease, and encouraging good dental hygiene and regular check-ups. 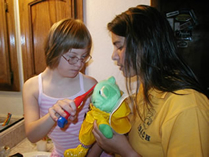 Because many children with Down syndrome have motor impairments that can interfere with good oral hygiene, its important to check periodically to see that the youngster is using proper techniques for brushing and flossing. Because dental caries are not a major problem for people with Down syndrome, the nurse doesnt need to focus on oral hygiene.